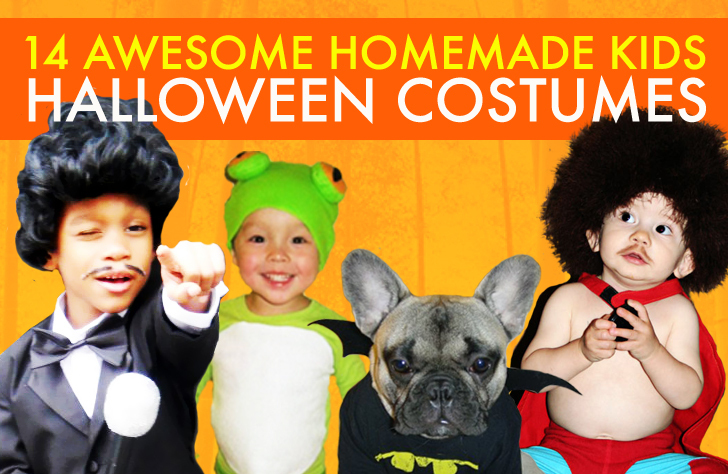 Halloween is here at last, but don't fret if you still haven't cooked up a creative costume - we've rounded up 14 incredibly creative DIY costumes for kids! From the most adorable Marty McFly to R2D2, Nacho Libre, and Where's Waldo, click through our gallery below for a bit of last minute inspiration. And if you've got a terror-ific homemade costume for your little ghoul or goblin, we're offering the perfect chance to show off your crafty talents in our annual Inhabitots Green Halloween Costume Contest. With over $300 in exciting green prizes and TWO grand prize winners up for grabs, our green-themed contest is bound to make Halloween even more spooktacular. 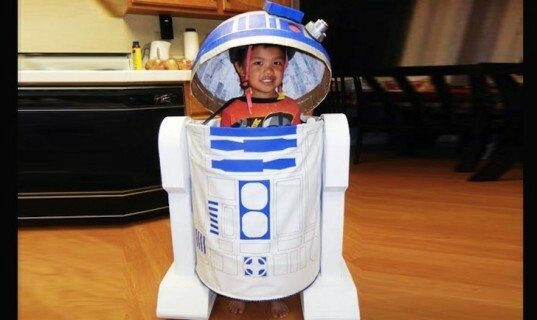 Set your little one off on a galactic adventure with this papier-mâché R2D2 costume! This comfortable, yet super detailed costume was even designed with fully functioning lights and sound effects. 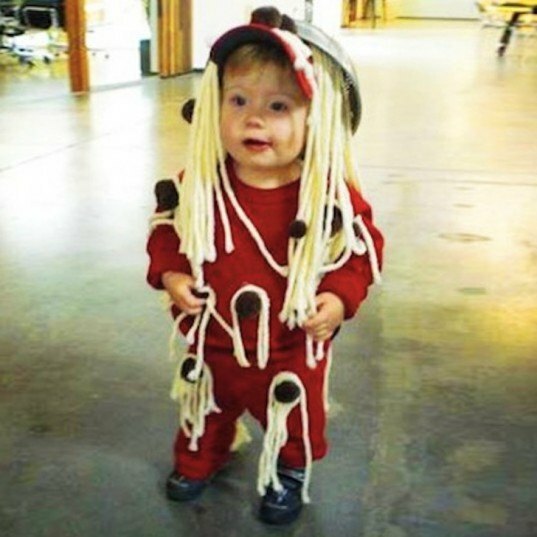 Turn messy eating into an adorable costume with a bit of yarn, pom-poms, and an upended spaghetti bowl! Channel your baby’s inner luchador with this simple yet hilarious Nacho Libre get up and soon he’ll be ready to Nachooo! Want a costume that’s sure to win over the ghouls? Dress your kiddo up in the fashion of charmingly smooth singer Sammy Davis, Jr.
Here’s a deliciously sweet costume that’s sure to make your mouth water. This nifty Starbucks frappucino is even topped off with a straw and a drinking hat! 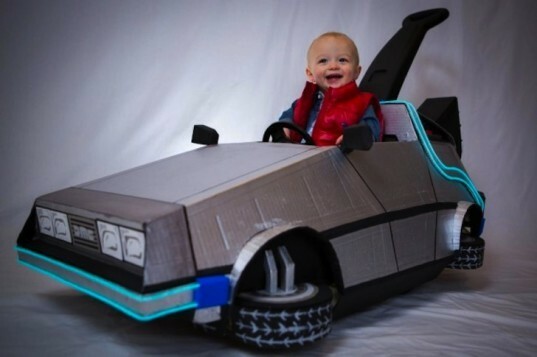 Trick-or-treating with a stroller can be tricky – that is, unless you turn that push car into a flying DeLorean! Made out of recycled cardboard, Baby Marty McFly’s DIY car is a seriously sweet ride. Made of 100% recycled materials, this wagon-turned-moustrap lets your baby squeak their way to maximum comfort! 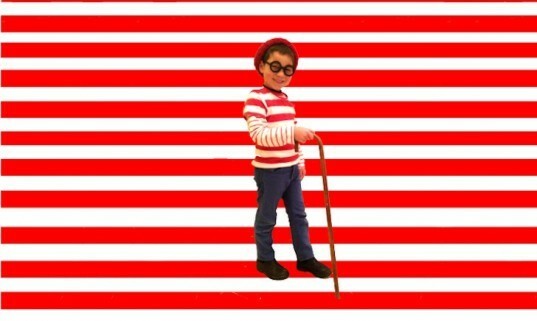 Stripes never go out of style, which makes this Where’s Waldo costume the perfect cost-effective ensemble that still stands out in a crowd. 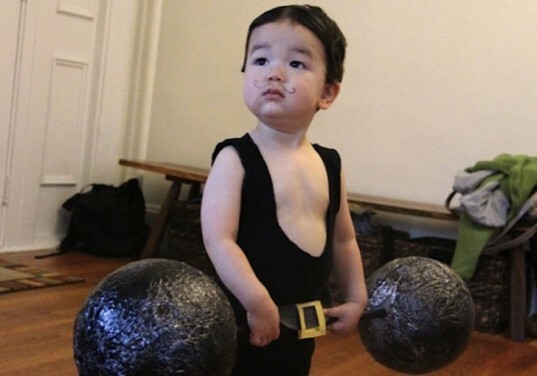 Let your kid show off his muscle power with this easy costume that turns an old black onesie into the perfect strongman outfit. 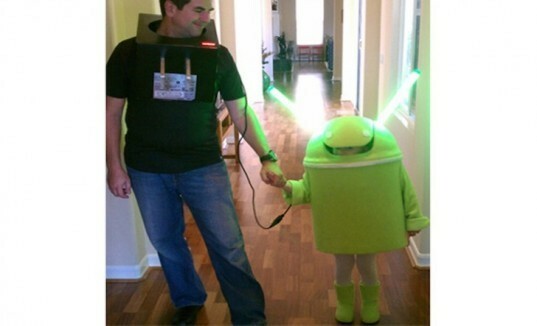 Android fans can brighten up the night sky with this adorable round costume equipped with energy-efficient cold-cathode lamps. The sky’s the limit for crafting DIY! Using a mix of old clothes, cardboard diaper box, and a frisbee transform your kid into a first-class pilot. 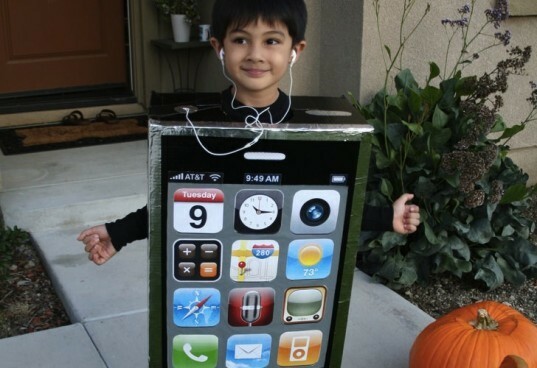 iPhone costumes are always a popular option and can be a green dream if you make them out of recycled cardboard! Test your DIY savvy with this Statue of Liberty costume made almost entirely out of mom and dad’s old clothes! Turn messy eating into an adorable costume with this easy and simple upended spaghetti bowl! 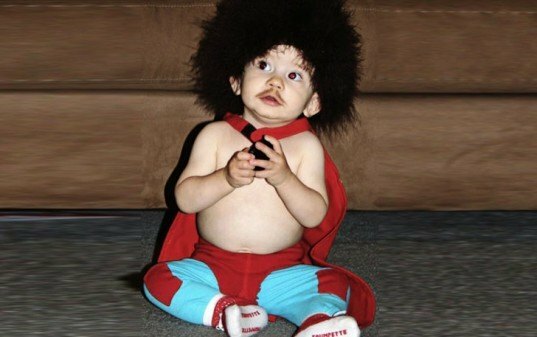 Channel your baby's inner luchador with this simple yet hilarious Nacho Libre get up and soon he'll be ready to Nachooo! Want a costume that's sure to win over the ghouls? 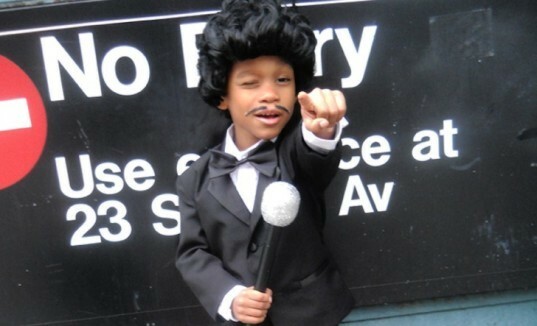 Dress your kiddo up in the fashion of charmingly smooth singer Sammy Davis, Jr. 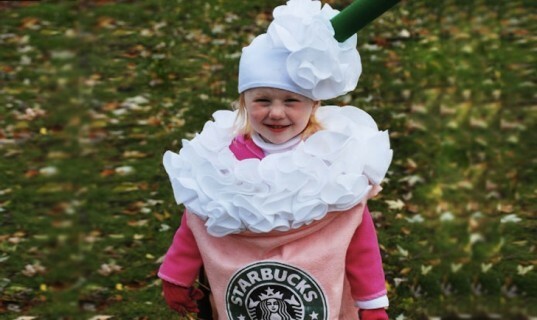 Here's a deliciously sweet costume that's sure to make your mouth water. This nifty Starbucks frappucino is even topped off with a straw and a drinking hat! 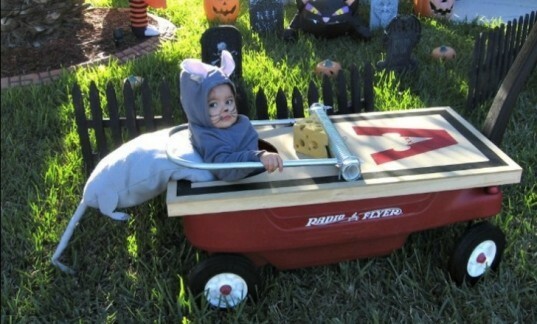 Trick-or-treating with a stroller can be tricky, that is, unless you turn that push car into a flying DeLorean! Made out of recycled cardboard, Baby Marty McFly's DIY car is a seriously sweet ride. Stripes never go out of style, making this Where's Waldo costume the perfect cost-effective ensemble that'll still stand out in a crowd. The sky's the limit for crafting DIY! 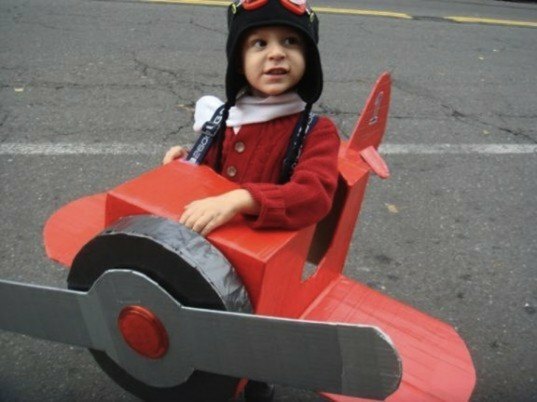 Using a mix of old clothes, cardboard diaper box, and a frisbee transform your kid into a first-class pilot. 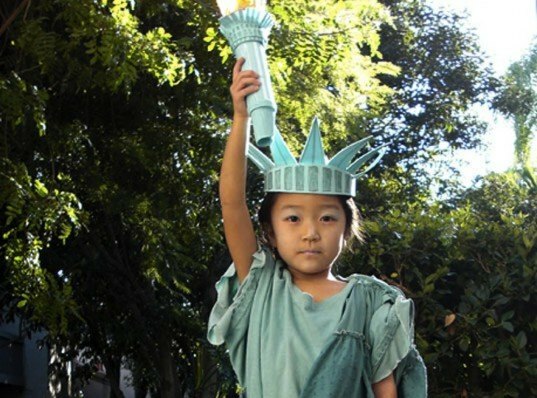 Test your DIY savvy with this Statue of Liberty costume made almost entirely out of mom and dad's old clothes!